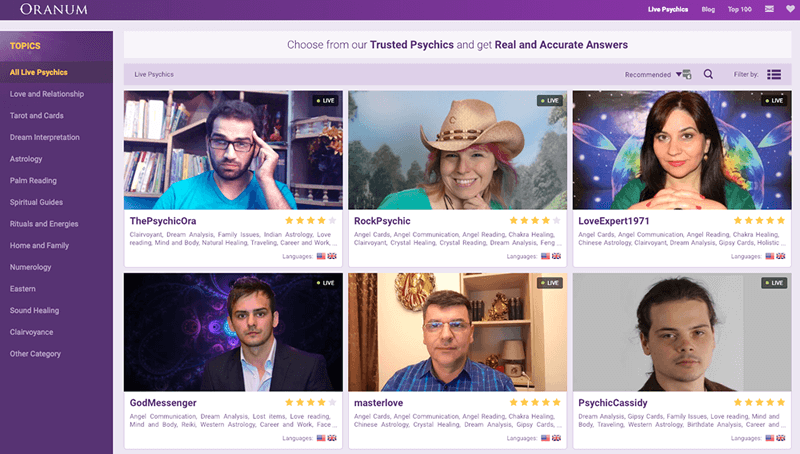 Oranum Psychics Review & Ratings in 2019 | Scam or Accurate Readers? You must have read a lot of Oranum reviews but this will help you understand why we think this is a great website to start with. ​“Confused? We have clarity!” This is the slogan of Oranum, the online spiritual community that’s helping millions of people all over the world reach enlightenment with their issues and everyday problems. Everyone comes at a crossroads in life, or have a major problem, or are simply having a bad day. Life is full of ups and downs, and at the end of the day, having someone listen to you is all it needs to make it better again. Oranum offers 100's of psychics, advisors, clairvoyants, and healers, who are at your disposal 24/7. One of the most recognized names in the world of online astrological services, they are proud of being the only company to offer personalized webcam sessions with psychics and customers – literally unheard of before they came into the game. Upon entering Oranum’s website, you’ll immediately get a feel that it’s more of a community rather than a company trying to sell you products or services. The site went live in 2011 but the company had been well-known and established in Poland even before they decided to branch out to the US and the rest of the world. The site offers the services of psychics from different countries. And this is what makes Oranum stand out from every other online psychic site out there. The advisors or guides are not only limited to the US or a certain country, but the best and leading psychics from different parts of the world are only a click away. Aside from these services, the site also offers daily horoscopes for their members, such as Western horoscope, Chinese horoscope, Mayan, and Aztec horoscope. The great thing about Oranum is their selection of psychics. Most other sites simply have advisors post their screen names, profiles, and ratings without proper screening. This means that other sites allow absolutely anyone to easily make a profile and declare themselves as psychics. Oranum has a rigorous screening process when it comes to their advisors. They have two qualities to look for: someone who has strong spiritual abilities, and someone who has a great desire to help. Aside from Oranum’s slogan, they also have a mission, and that is to help people. When you visit the site and want to get started, you simply open an account, create your profile, and start choosing a category. Under this category is the directory of psychics, making it easier for customers to find the one that suits their needs. Once you’ve chosen a psychic, you have the ability to connect with him or her through chat with no cost at all. You can talk to your chosen psychic via chat before you make the commitment of having a reading done. This is beneficial and advantageous on the customer’s part since there are no obligations whatsoever. The free chat is a great way to get to know the psychic and to find out whether or not he or she can help you. Once you decide you are a good match, then you can choose to have the official psychic reading, with differing fees or rates depending on the psychic. Offers Free Chat Service – As mentioned, you have the option of connecting with a psychic through chat before you make the commitment of actually availing of their services. This is a great opportunity to get a general feel of the psychic so you know you’re not wasting your money on someone who doesn’t understand your needs. Selective Screening Process – At Oranum, you know the psychics or advisors have the experience and the expertise to handle your problems or questions. Their advisors aren’t just anyone who created an account with the site – but they are legitimate and authentic psychics or clairvoyants who have the capacity to truly help. Video Call Mode of Communication – This is hands down, Oranum’s best asset. They were the first site to offer such set-up, creating a very personalized experience between the psychic reader and the customer. There is no US contact number for customer service, making it a big headache if you have any concerns or inquiries with your profile or registration, or if you have any complaints. A European number is available, though, but can be a tad expensive if you’re calling from the US. Confusing interface takes a while to understand. There are so many things going on on the site, making the process a little confusing when you first start out. They offer from tarot readings (tarot cards, angel cards etc.) to energy healings and it all depends on what type of reading you seek. Oranum’s strong points are definitely their selective psychic process and their video call option for communication. When you want to divulge personal information about yourself, you’d want someone whom you can trust and believe will hold your hand in the process to healing or finding an answer. ​Oranum’s selective process gives you faith and assurance that the advice you get is legitimate and comes from someone who actually knows what he or she is doing. The video call option takes it to an entirely different level and makes everything personal and truly intimate. Although there are some weak points to the site and the company’s customer service, Oranum is still one of the best online psychic networks to try.